The Flux is a newcomer to the banjo world, but since its patent was issued early this year, every Flux job I have done has been a success, and I think every banjo player should know about it. The easy and no-risk way of testing a Flux attachment is to install a Nechville neck. 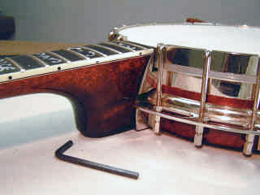 It’s a completely reversible process that will show you how good your banjo can sound and feel. Recently Tom Nechville took the opportunity to “flux up” an original Gibson. Prior to the operation, the action was way too high, and the bridge was too low. No amount of ajustment can fix that. But with a Flux capacitor and a neck refit, you have a completely new banjo with adjustable neck angle so you can use whatever height bridge you want, always with perfect action. The fit to the body is improved because of the solid interface and greater surface area of attachment, and the solid mounting of the Flux piece itself to the coordinator rods. We have not done that many original neck conversions this way because there is no going back and most people like our necks better anyway, but it is an option and we think a good one for improving your banjo without going for a whole new neck. Hey did you know that a secret benefit to owning an Atlas openback is that you get a free re-usable Flux capacitor on every one?